Most of us who have grown up using toilets within our homes have little idea of how the majority of Indians, especially those in rural areas, manage with this bodily activity in the absence of toilets and septic tanks. Tallulah D’Silva, architect and founding curator of the Global Shapers Community in Goa, talks of eco loos that not only provide a hygienic space and privacy for these people to get on with their daily ‘business’ but, also create fertiliser out of human stools in the most efficient manner. The Eco Loo Project that is part of the Global Shapers Community endeavour to effect positive change in society and the community, was discussed at Shape Connect Goa, an event that brought together individuals to focus on much needed transformations based on the United Nations’ Sustainable Development Goals. Although Goa has a high rate of rainfall, we still face water shortage. All our perennial springs have been polluted, usually by migrant workers. The reason for this is that the places that are rented out to them do not have the mandated toilet and bathing facilities, and the people find these areas safer and cleaner. The panchayats are not doing their job in maintaining these springs or making sure they are pollution free either. Building regular toilets, which need a considerable amount of water, is not as feasible as installing dry toilets or eco loos. 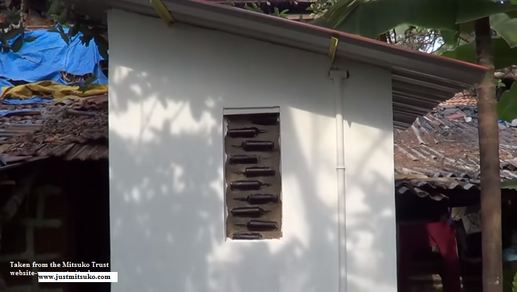 These dry toilets are built above the ground and are perfectly usable in regions with extreme water pollution, and water logged or desert areas. After every visit to the loo, some sawdust, a pinch of lime and ash is added. The sawdust absorbs the moisture, and the ash and lime destroy the pathogens. In time, the mixture becomes dry like a cake and makes excellent manure. Surprisingly, these eco loos are odour free. In Karmali, the eco loos have been built in collaboration with the Mitsuko Trust that works with the young children in the hamlet. The first loo was constructed with laterite stones and glass bottles. 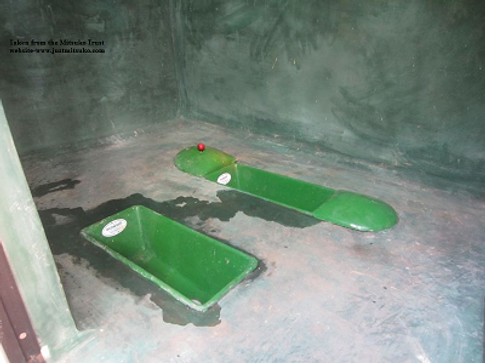 Inside the structure, the pan has three sections with one section used for urination and washing and the other two for defecation. The two defecation sections lead to a chamber each. So they are used alternatively as one chamber gets filled up within three months. Then the other chamber is used while the full chamber goes through the process of preparing compost. Minimal contact with water is allowed. A plastic can of water with an attached faucet is used for washing. It is sealed for a minimum period of six months to allow for the destruction of lingering pathogens with the heat generated by the biochemical process that takes place. To conserve water, there is a root zone system with canna plants (the G2H20 Project) that recycles grey water. ‘I feel dry toilets are a solution for all of us,’ says Tallulah. The surmise that we are in a better position than these migrants and people in rural places in matters of hygiene and cleanliness because we flush away the waste, is completely false. We have to remember that the waste is eventually flushed into the sea, contributing to pollution, and has introduced E.coli into Goan seawater. Talullah recommends that the old style portable toilets in the form of a wooden box with a seat and a bucket under it, which needs to be emptied every ten days into a composting pit, should replace modern toilets to solve the water pollution problem (in South America these are known as eco baños). The idea that human faeces is disgusting, to be flushed away out of sight, should change. Tallulah’s involvement with the Terra Preta (black soil) Conference led her to discover that the Amazonian forests had flourished because of this black soil that had been generated from the traditional composting methods using biochar or ash to covert human faeces into manure. ‘We need to look at waste as a resource,’ says Tallulah.